Pittsburgh's Largest Job Fair of the Summer Coming July 20th at Consol Energy Center! The 10th annual Pittsburgh Diversity Employment Expo Job Fair series will continue this year on July 20th at Consol Energy Center from 10:00AM to 3:00PM. Back in March over 1,500 job seekers were in attendance to speak with 90 companies and schools that were on hand. 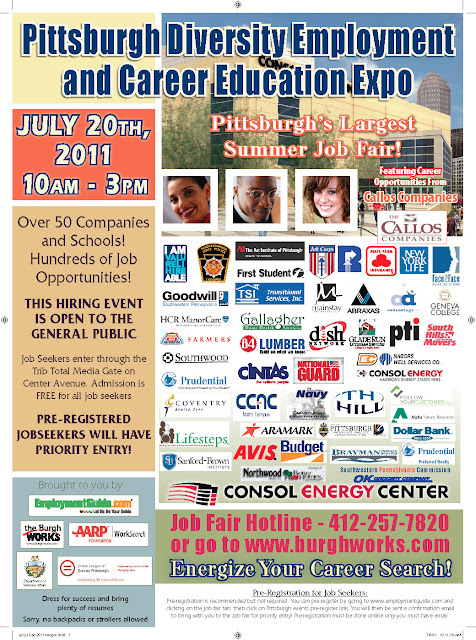 Produced by the Pittsburgh office of EmploymentGuide.com and co-sponsored by The Urban League of Greater Pittsburgh in association with AARP Foundation WorkSearch and the Allegheny County Department of Veteran's Affairs, featuring career opportunities from Callos Companies, an outplacement and recruiting company, this event is open to the general public and free for all job seekers. Positions being offered will be in healthcare, nursing, oil/gas, manufacturing, banking/finance, Insurance, sales, customer service, retail, military, hospitality, drivers, social services and much more. Job seekers can pre-register by going here and following the promps.